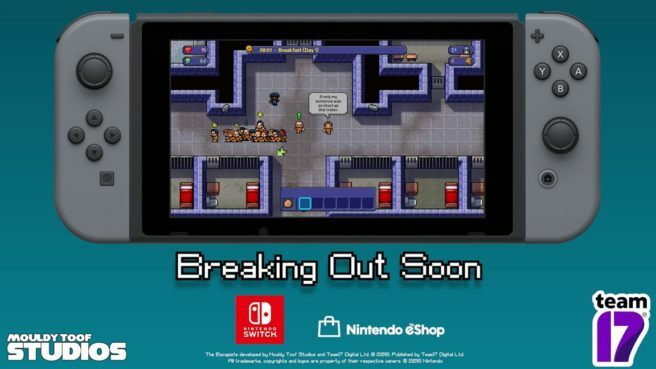 The Escapists: Complete Edition is coming to Switch on September 25, Team17 has announced. It’ll include all prisons from the base game plus nine bonus maps, including one which has never previously been released on console – ‘Fhurst Peak’. Escaping won’t be easy. You’ll have to work around the strict prison schedule and avoid the unwanted attention of guards! You’ll need some cash to put your plan into action, so be prepared to get a prison job or perform favour requests for fellow inmates to earn those vital funds. Use your hard-earned cash to barter with traders for tools and crafting supplies, and make sure you find a good hiding place for your stash. And don’t forget to pay attention during roll call to avoid a cell shakedown – you wouldn’t want to lose that coveted shovel you’ve worked so hard to craft! – Multiple ways to escape – A variety of different methods to bust your way out including digging out and prison takeovers! – Deep crafting system – Gather the necessary items you’ll need to craft items for your escape plan. Craft tools such as Cutters, Shovels, Sheet Ropes and weapons such as the Sock Mace, Comb Blade or Cup of Molten Chocolate! View a new trailer for The Escapists: Complete Edition below.